This is how you declare an ArrayList of Integer values. You can do same to create an ArrayList with String objects as well, e.g. don't forget the suffix 'f', it's important because by default floating-point numbers are double in Java. This is Ok to print values, but it's not an ArrayList. You cannot add or remove elements into this list but when you create an ArrayList like new ArrayList(Arrays.asList()), you get a regular ArrayList object, which allows you to add, remove and set values. 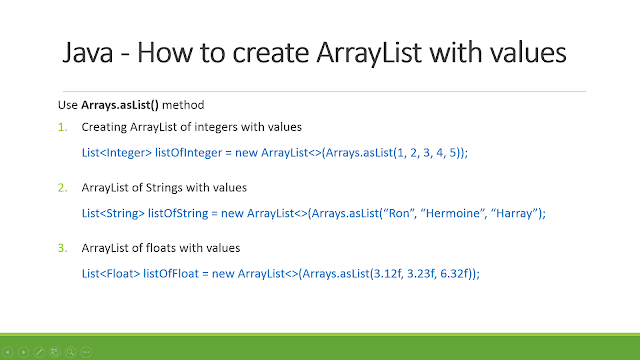 That's all about how to declare an ArrayList with values in Java. You can use this technique to declare an ArrayList of integers, String or any other object. It's truly useful for testing and demo purpose, but I have also used this to create an ArrayList of an initial set of fixed values. If you a beginner in Java and just started learning, then you can read Head First Java 2nd Edition, but if you are experienced Java developer and looking forward to taking your knowledge of Java Collections framework to next level then read Java Generics and Collections from Maurice Naftalin.